These medals pay tribute to a key figure of the Easter Rising. Yes, I agree to contact via mail with product offer. 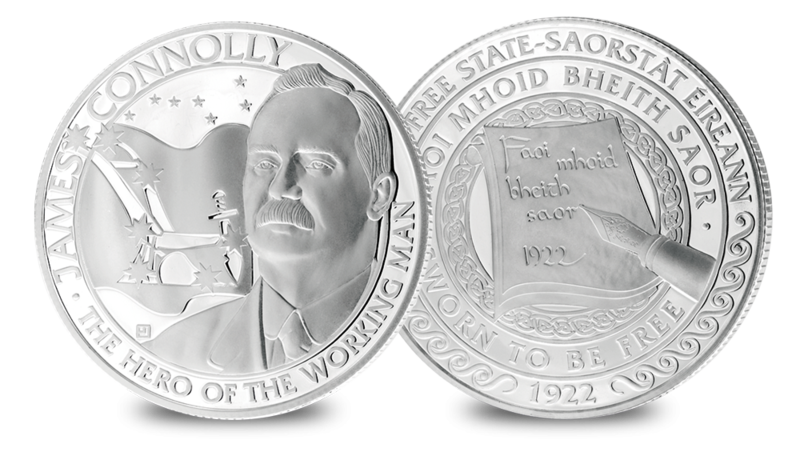 The James Connolly commemorative medals is part of the seven signatories set which includes seven portraits of Irish Heroes. Each medal depicts the portrait of one of the Seven Signatories, together with their name and a fitting individual inscription. The commemoratives all share a common reverse design inspired by ‘Amhran na bhFiann’ (‘A Soldiers Song’), which was first coined during the Easter Rising and then adopted as the national anthem of the Irish Free State in 1926. James Connolly was a Scottish-born socialist whose role in the Easter Rising has become part of Irish legend. The commemorative shows a portrait of James Connolly with the Starry Plough flag, which symbolises the present and the future of the working class respectively. Whilst the inscription compromises the words ‘The Hero of the Working Man’, as he sought to protect workers, and was the commander for the ICA which later took part in the Easter Rising.